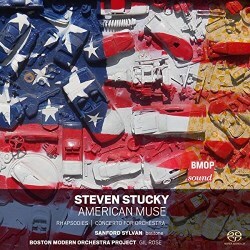 Steven Stucky came from the tradition of American composers who combine composition with teaching. His predecessors in this include such composers as Walter Piston, William Schuman and Roger Sessions, all excellent composers and all too little known this side of the pond. Recordings can remedy this but the recording of American composers has too often been rather a hit or miss affair and the discs themselves are also not always easy to get hold of. I do find it strange that this big country, with all its wealth, finds it more difficult to record its native composers than does, say, Finland, but I dare say it is all down to the economics of concert giving and recording. Enter at this point the Boston Modern Orchestra Project (BMOP). I am ashamed to say that I have only recently discovered this wonderful programme, which, in its own rather charming words, ‘explores the music formerly known as classical’. That is to say, it mounts performances and recordings of contemporary works, giving them an audience beyond that of their premiere. This is their fiftieth release, and I hope to explore some of the earlier ones as well. Goodness knows how it is financed in general, but for this disc there are credits to the National Endowment for the Arts (which the current president wishes to abolish), the Aaron Copland Fund and an anonymous donor. All honour to them. Meanwhile, this is the first of the BMOP discs to come my way and Stucky turns out to be a real discovery. - The music should sound beautiful, but sounding beautiful is not merely cosmetic. It is an essential attribute of the way the music speaks, of what the music means. The very sound itself is the heart of the matter. - It should emphasize the importance of harmony. - However rich and complex its sonic surface may become, the music is usually laid out in broad, clear, simple, audible forms. - The notion of drama plays a crucial role. - The music should always communicate, or at least strive to communicate, something deep and eloquent and human. All these qualities are in evidence in the first work here, Rhapsodies, a concert opener. The sheer sound of it is gorgeous: it opens with shimmering woodwind high in the treble, gradually creeping downwards. Later there are rising passages in the brass and a wonderful slow string melody which gradually builds to a climax. I was immediately gripped and subsequent playings have confirmed my admiration for this work. American Muse is a song cycle for baritone and reduced orchestra. What struck me here was the clarity of Stucky’s word setting. It reminded me of Britten. There are four poems in the cycle: John Berryman, ‘American Lights, Seen from Off Abroad’; e.e. cummings, ‘Buffalo Bill’s’; A. R. Ammons, ‘Delaware Water Gap’; and Walt Whitman, ‘I Hear America Singing’. The first three all have something sinister about them – they all mention death – but none of the settings are what you might expect. The Berryman setting is light and jazzy, perhaps also with a touch of Copland. Buffalo Bill’s is both comic and sardonic, which at the climactic phrase ‘Jesus he was a handsome man’ echoes Berg. The Ammons poem is serene and withdrawn with an emphasis on mysterious harmonies. Finally ‘I hear America singing’ is a kind of hymn to everyday life and work. I thought I might find the cycle parochially American but it is not or, if so, only in the sense that Mahler’s song cycles are Austrian: others can enter into them. The Concerto for Orchestra, the first of two Stucky wrote, is by some way the earliest work here but is fully assured. The first movement throws a number of different ideas at us, each of them attractive and beautifully scored but with no obvious links. The second movement is a quite different, developing a theme which starts on the strings. The third movement is more like the first, with a number of cadenzas but leading to a conclusion. To be honest I found the argument difficult to follow, but I did not mind because the sound is so lovely. Although these are not billed as live performances I feel sure that the orchestra has played them in public as they sound well rehearsed and confident. The orchestra personnel are all listed in the booklet, from which I say that they changed somewhat across the three works, no doubt because the recordings were made some years apart. I presume they are all premiere recordings though the booklet does not say so. Gil Rose, the moving spirit behind BMOP and their main conductor, is obviously committed to giving new and recent works good performances and obtains assured performances. The baritone in American Muse, Sanford Sylvan, is well known not only for his performances of contemporary works such as several parts in John Adams but also for his Mozart. His smooth and well-produced voice carries the vocal line well and you can hear all the words. The recordings were all made in the same venue, which is the hall they usually perform in, and they are warm and full — I was listening on ordinary CD though this is a SACD. The booklet, in English only, has helpful notes on which I have drawn. These are prefixed by an article by Steven Stucky on his musical influences. This was, rather confusingly, written for a performance of his second Concerto for Orchestra, which is not the work included here. I consider Steven Stucky a real discovery and I am now off to order the recording of that Concerto for orchestra No 2, which turns out to be available on BIS CD-1622.